There can be a temptation to dismiss wing three quarters, to give them their Sunday name, as the galloping show ponies of rugby. Blessed predominantly with raw speed, they are the ones who scorch in for the glory and leap over the line after the forwards have sweated blood, the half-backs have picked the lock and the dashing centres have opened the door. Of course, that is a simplistic view of the wing’s art and there have been plenty down the years with abundant skill and intelligence as well as the ability to run like the wind. One of the all-time greats David Campese weaved his peerless magic from the flanks, although the great Wallaby viewed the entire pitch as a playground for his genius. The late great Jonah Lomu put a more direct but no less thrilling stamp on the wide role. It is true, however, that those who display a great all-round game at a young age are often guided into the stand-off’s No 10 jersey, the playmaking equivalent to American football’s quarterback. That is where Blair Kinghorn earned his spurs playing schoolboy rugby at Edinburgh Academy, his lightning speed augmented by a wider skillset that may not have been fully utilised out on the wing, the position in which he made his Scotland debut off the bench against England last week and gets his first start in Dublin on Saturday. Upon turning professional with Edinburgh straight out of school, full-back was viewed as the better berth to bed him in at the higher level and that is where he has gone on to cement his reputation as one of Scotland’s most promising young talents. This season, the 21-year-old has been topping the Guinness Pro14 stats tables in defenders beaten, breaks and metres made. From six months ago, when club coach Richard Cockerill deemed him still too green for the Test arena, he has thrust himself into Gregor Townsend’s starting XV. “I’ve moved there a few times during games but only ever started a couple [at wing],” said a delighted Kinghorn yesterday after his selection, due to Tommy Seymour’s back injury, was confirmed. His last start on the wing came in the 1872 Cup win over Glasgow at Scotstoun in the last game of the 2016-17 season. “It’s just a bit different with your positioning in the back three,” he said. “It is quite similar to 15. We’ve worked hard all week and I’ve been working on all the positions. A regular lack of accuracy was Cockerill’s autumn reasoning that Kinghorn had work to do to prove he was an international player, with a habit of throwing in at least one howler every game to take some of the gloss off otherwise eye-catching displays which showcased his raw natural talent. Cockerill gradually amended that view as the season progressed and Kinghorn’s performances continued to impress with increasing maturity and game awareness. A strapping 6ft 4in, if still a tad coltish in weight, the big-booted Kinghorn’s youthful sporting all-rounder status is further enhanced by the fact he was briefly in the Hearts football academy. “I was a sweeper/centre back. Hoof it long,” he said with a smile of an ability he has transferred impressively to the oval ball. He believes the wider feelgood factor at the capital pro team this term has helped his development. Townsend hinted pre-tournament that wing may be where Kinghorn would be blooded and has been impressed by the progress made in recent months. “He has matured by making mistakes and realising that it’s not going to get him too far in his rugby career,” said the Scotland coach. “You need to go through that period. The first two months of the year, he was outstanding. Then he did have a few games where he made errors or lost his focus. “In the last two or three months, he’s been back to even better form. 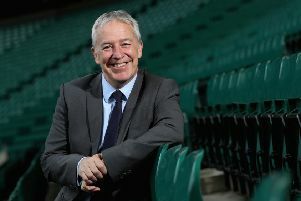 That’s a credit to him and the guys working with him at Edinburgh.